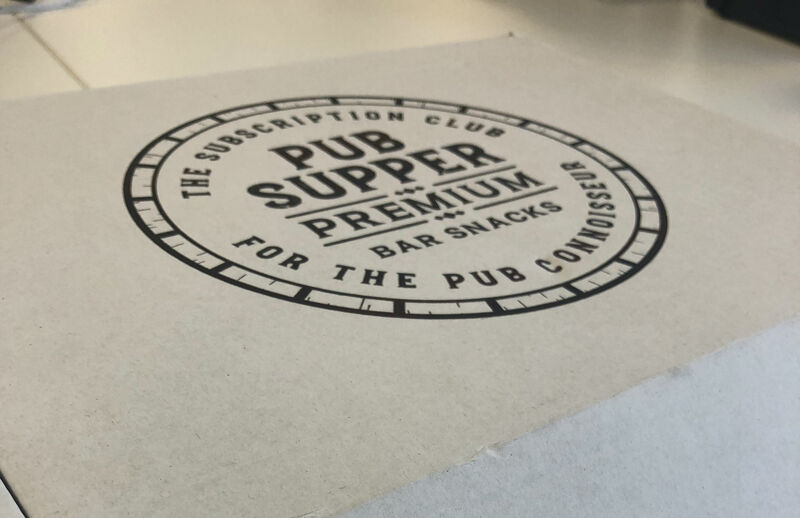 Pub Supper is a novel monthly subscription box for lovers of classic pub snacks - flavoured nuts, pork scratchings, biltong and jerky, popcorn, olives or crisps - whatever your go-to, Pub Supper has it covered! This week, Claire, our Head of Ops, proud Northerner and lover of all things pub-related gives us a breakdown of what subscribers can look forward to. "Your perfect evening might be sitting in a pub with your mates, chatting, having a pint and eating some traditional pub snacks... but sometimes you can't be bothered to leave your sofa! If this is you, then this box will be right up your street, quite literally. It delivers precisely what it says on the tin (box), but with a twist - you won't just get your bog standard ready salted crisps, or some sad looking peanuts - instead, you get a mix of tasty and slightly unusual variations on pub snack classics. When the box first arrived, the anticipation in my house: my husband, our six-year-old son (who is a crisp monster) and I, was pathetically high. You'd think we never eat. When we opened the box, there were a lot of "oohs" and "aahs" as we looked through it. We had a bit of a bun fight as to who was getting what - but there is so much in the box that nobody was left disappointed. There was the kind of pub snacks you would expect - crisps, peanuts, popcorn & pork scratchings, along with more left-field items like chorizo pieces, biltong & pretzels. Everything was in lovely packaging, the peanuts, for example, came in a cute patterned tin, and had a crunchy coating which was delicious. When I opened the jalapeno pretzels, the smell was so punchy that they smelled like, and this is the only way I can describe them, pure pain. However, my husband claimed these and said that they were the most delicious things he had ever eaten. But they are not for the faint-hearted, you have been warned! The popcorn was espresso martini flavoured, which I was a bit gutted about as I don't like coffee. But once I tasted it, I couldn't stop eating it until I'd finished the whole packet. The only downside is that it makes your jaw ache - well, eating the whole packet would do that I suppose! Pub Supper is priced at £19.95 per box. I thought this was a bit steep to start with, but on reflection, with ten items in the box, it's pretty good value. The feeling you get when you open the box is that it's jam-packed with goodies, a lot of which you wouldn't find in the shops, and it's delivered to your front door! To summarise, it was a different, yet delightful experience to receive a mystery box of snacks in the post - I didn't really get the concept when I first saw it, when you could go to Sainsbury's yourself - but the element of surprise is fun, and you'll receive things you don't get in the shops. The quality of the snacks themselves is excellent, and there is something for everyone. There's enough to last until your next box - or you can eat the whole box in one evening (like us)." Munch on premium, pub-inspired snacks every month with a subscription to the Pub Supper box. Enjoy the delicious perks of the pub from the comfort of your home. Get the grub you love today!